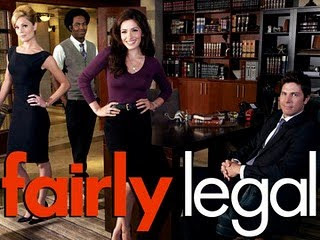 I went to the Fairly Legal special screening on the Wednesday that just gone by and man, I am quite disappointed. Not with the show, but the lack of going-on in the event. Went to pick up this girl to accompany me, haha. The drama is about Kate Reed, a person who moved from being an attorney to a mediator instead. What's a mediator? A person who does settlement out of court who tries to bring an agreement between the 2 feuding parties. This is the 1st time I'm hearing a mediator. I guess it's not that popular here in Malaysia but the States surely do need something like that since there's so many lawsuit battle most of the time. Anyway, the show is fairly interesting seeing as to how Kate resolves conflict using many different methods such as the Solomon resolution method (threatening to destroy the one precious item to both parties), the offense is the best defense method and stuff like that. But I do think that this show is a bit too irrelevant for Malaysian audience. But hey, people do love to plop in front of the TV lazing on the couch after a hard and long arduous day at work. The show debuts in May 5, 2011, 9pm for Malaysia at the Diva Universal Channel on Astro. That's channel 702. But then, if you tell me the event is around dinnertime and inform that there'll be food served, I expect dinner. But instead, we were served mostly finger food and snacks. I believe, a lot of people did expect to have dinner there cause I saw quite a few left before even the screening ended. Okay, gonna go off topic from here on. Lately, I haven't been updating much even though I still have been attending some events. I guess the mentality of wanting to quit everything has started kicking in to gear. Friends have been asking why I don't tweet much anymore too. haha. Ah well, somehow I just felt like I wanna blog about this event, even though I'm a little disappointed in it.